Faith leaders gathered at the Capitol on Friday to urge Gov. Tim Walz to oppose Enbridge Energy's Line 3 crude oil pipeline replacement, while a mostly Republican group of lawmakers urged him to let the disputed project move forward. 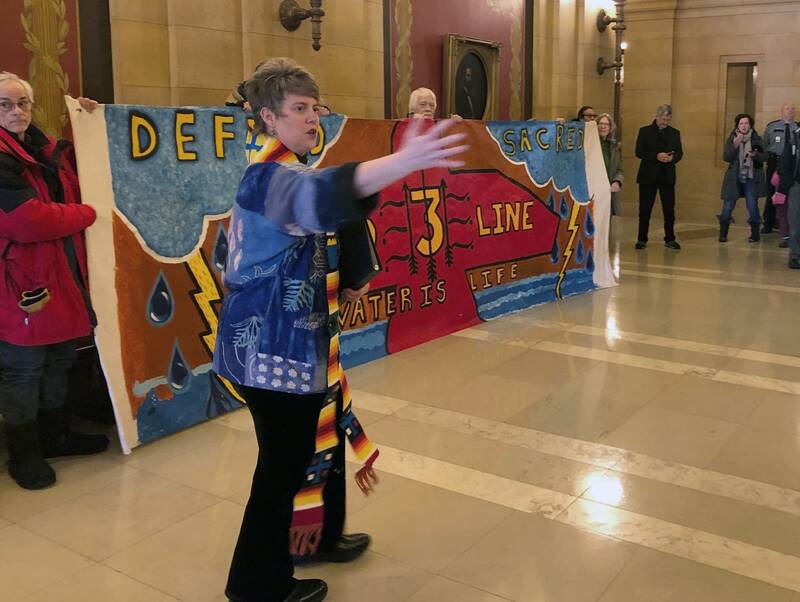 Around 100 clergy and laypeople connected with Interfaith Power and Light prayed in the governor's ornate reception room and presented staffers with offerings of wild rice for Walz and Lt. Gov. Peggy Flanagan. An Ojibwe elder led the group in a traditional water ceremony. "As spiritually rooted people, as people of faith and moral conviction, we are gathered to say no to that which threatens the water and our lives," said the Rev. Dr. Rebecca Voelkel, director of the Center for Sustainable Justice, a ministry of Lyndale United Church of Christ in Minneapolis. Deputy Chief of Staff Kristin Beckmann welcomed them and said she'd convey their concerns. "I am moved by the power and energy you bring into this room," Beckmann said. Meanwhile, Senate Majority Leader Paul Gazelka, House Minority Leader Kurt Daudt and 75 other lawmakers wrote to the new Democratic governor, urging him to drop a legal challenge that began under Gov. Mark Dayton's administration. The lone Democratic signatory was Iron Range Sen. David Tomassoni. Line 3 carries Canadian crude from Alberta to Enbridge's terminal in Superior, Wisconsin. Enbridge wants to replace the 1960s era pipeline because its maintenance needs are accelerating and it now can run at only about half its original capacity. The route crosses lands where Ojibwe tribes claim treaty rights. The independent Public Utilities Commission approved Enbridge's proposal last year. The Minnesota Court of Appeals earlier this week dismissed appeals by several Line 3 opponents, including the state Commerce Department, saying the legal challenges were premature. Instead, the court said they could refile petitions for reconsideration with the commission by Tuesday. Since the regulatory panel is expected to reject those petitions, the administration has the option of refiling just to preserve its legal options and deferring the big decision on whether to go back to the Court of Appeals. "Making sure the project moves forward is an important opportunity for Minnesota to demonstrate its economic and environmental leadership to do things right for people and businesses across Minnesota," the legislators wrote. Honor the Earth, an indigenous-based environmental group with official status the in Line 3 proceedings, this week circulated tweets Walz made in 2017 in which he wrote: "Any line that goes through treaty lands is a nonstarter for me" and that "every route would disproportionately affect native people. Unacceptable."